Behind the Scenes on Luke Ramer's "Under the Rainbow"
For the last couple of days I was pleased to act as a grip on Luke Ramer's new movie. I had to leave early to cram in a quick vacation before the students return for the Fall term next Monday but I plan to rejoin the crew as soon as possible. Director, Luke Ramer and Assistant Director, Rachael Ingram in "video village"
My proud attempt at simulating morning sun coming through a kitchen window. Norm checks out my handiwork. 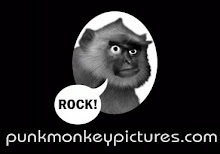 Punkmonkey Update - New Movie Title and more!